Pan Dimensions, a Minneapolis, MN based Steel Drum Band covering the Twin Cities and Metro Area of Minneapolis / Saint Paul. Pan Dimensions is the perfect background music for any event, ambient and beautiful with pulsating rhythms that are perfect for any festival, corporate event or private party. Pan Dimensions play ambient acoustic steel band arrangements. Pan Dimension’s colourful Caribbean steel band music has the perfect sound level to create a relaxed ambient atmosphere for entertaining your guests. You can hire the band to provide light entertainment as a 2-3 piece steel band, depending on your requirements for the event. 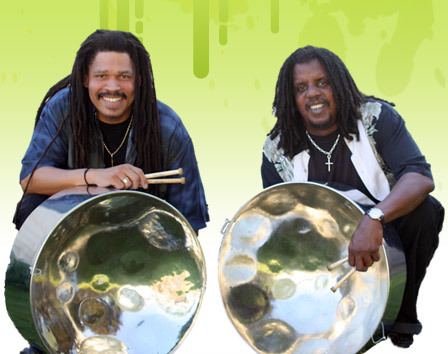 With Pan Dimensions roots running deep into the Caribbean and branching out all over the world, their steel drum music is a fresh sound that captivates audiences. Lance and Chilly work together arranging and composing songs that are familiar with a Caribbean twist. They use today’s technology in their studio to incorporate Caribbean and conventional music. Lance plays the lead pan and Chilly a set of double second steel drums creating notes, chords and melodies that are arranged with structure and progressions that bring together the improvised sound of Pan Dimensions. A sound you won’t forget! © 2019 Pan Dimensions. All rights reserved. All music on this site is the sole property of the original artist and management company.